Know how much sleep a child needs. For example, toddlers need 13-14 hours of sleep. Preschoolers are closer to 12. This time of the year everyone needs more sleep than in spring and summer. Keep a sleep journal to record your child’s sleep schedule. If you must wake your child he is not getting enough sleep. Know too, that you need 8.25 hours of sleep. Protect it! You are making choices, sleep or social media? Sleep or electronics? Choose sleep. Look at your daily routine. A good night’s sleep begins in the morning, with the decisions you make. Establish a regular wake time and maintain it within a 30-minute window 7 days a week. Establish regular meal times. Meals set the body clock. I use the work of Ellyn Satter who recommends six mini meals spaced every 2.5 to 3 hours throughout the day. Get outside for exposure to morning light and exercise. Establish a regular bed time. Protect it like a grizzly bear. A sample preschooler’s routine might be: 6:30 AM wake up, 7:00 breakfast, 8:00 outside play, 9:30 mid-morning snack, 11:30 lunch, 12:30 naptime begins 2:30 wake up and mid-afternoon snack, 5:30 dinner, 6:00 family play, no electronics, 7:00 bath and reading, 8:00 bedtime snack, sleep routine 8:30 head on the pillow for a total of 12 hours of sleep. A 2.5-year-old can easily nap 3 hours for a total of 13 hours of sleep – and depending on the child, you may need to move the head on the pillow to 7:30 for 14 hours of sleep. Maintain a sleep journal to see what fits your child. Protect naps and do not wake your child from naps. A tiny toddler, under 19 months of age typically still needs 2 naps every day. The first a mere 2 to 2.5 hours after awakening. The second about 3 hours after the first one ended. Older toddlers are ready to go down about 4 -4.5 hours after wake time. Preschoolers will last an average of 5-6 hours before they are ready for their nap. If a preschooler wakes at 7:00 AM by 12:30 he is ready for sleep. Miss the window for nap and the odds are high your child will get a second wind and not sleep. Know the sleep cues. There are three levels of sleep cues. Level one, red around the eyes, droopy cheeks, glazed look is when to put babies under nine months to sleep. Level two includes the yawn, eye rub, stumble, little difficulty listening, or remembering rules – but still happy and indicates when to put down all other children. Do NOT wait for the second yawn. 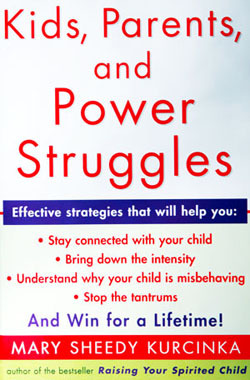 If your child is wild, crying, nothing is right and can’t settle she has hit level 3 and is over tired. Begin your routine earlier. Simplify your bedtime routine so it can be completed within 20-30 minutes. Observe closely after bath and reading is your child calm or more alert? If these activities alert complete them earlier in the evening or day. A sample routine is: bedtime snack, toileting, teeth brushing, pajamas, one book, or no book, cuddle, kiss, hug, prayer if you choose, and good night. When you hit the window for sleep your child will fall asleep within 25-37 minutes. If it is taking longer, look first at your daily routine – move bedtime earlier, or later as needed. If your child is “wired,” slow down the routine, but maintain the steps and the order of the steps. Do not “add” more. If your child needs touch, such as a back rub, or you near her, feel free to do so. Establish the limit that if she is laying down you rub her back, or lay next to her. If she gets up, you go and sit at the door. She can still see you, but for you to come back, she needs to lay down. Remove all toys from the room. Once she is settling easily you can gradually shorten the time you stay. If you choose to co-sleep and everyone sleeps well, it’s working for your family. Avoid electronics. The light and stimulation from electronics can trick your child’s brain into thinking this is time to be awake. Even infants and toddlers who are not watching, are affected by the light and movement on the screen. Know your child’s cry. Some children do cry before falling asleep. But the cry is not one of escalating distress. Instead it is a de-escalating, letting go. If it goes on for more than five minutes, or begins to escalate go back and offer comfort. If your child has been falling asleep easily and suddenly is not, know this is a red flag that something is up. Stop and think what could be causing her to feel stressed? Is she near her birthday or half birthday and going through a growth spurt? Has fighting between parents increased? If this is the case expect to provide more soothing calming for her to sleep. This is not forever, it’s for now, during this stressful time. And if there is a couple issue – see a counselor. 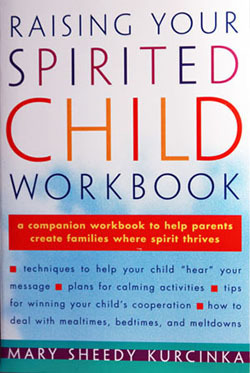 Spirited children are the emotional barometers of our families. They let us know when it is time to seek help and support. You’ll note from these ten steps that I do not ever use sleep training for spirited children. When a spirited child is not falling asleep it is important to look for the fuel source. What is keeping his arousal system on alert? Addressing the feelings and needs behind sleep disruption will allow your child to fall asleep peacefully. Spirited children can be GREAT sleepers. 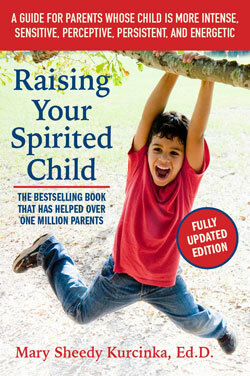 For more information read my books, Raising Your Spirited Child and Sleepless in America. 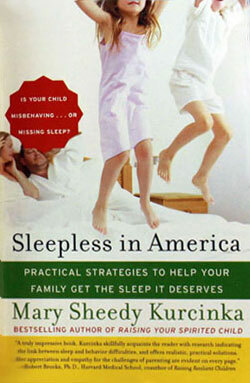 Or, go to my website at www.parentchildhelp.com to download the free brochure on children and sleep.